The Moderate Resolution Imaging Spectroradiometer, or MODIS, on NASA’s Aqua satellite and the MODIS sensor on NASA’s Terra satellite took photos of Japan’s earthquake and tsunami. Images were made with infrared and visible light to highlight the presence of water and other features on the ground. To find out more about the images, read the article in NEON. About three hundred people attended the annual Star and Reading Party held by NASA Explorer Schools educator Donna Rand and the staff at East Hartford-Glastonbury Elementary Magnet School. Students and their families explored a variety of science stations. They looked through large telescopes set up by members of the Greater New Haven Astronomical Society; viewed lunar craters and the moons of Jupiter; and learned about constellations by viewing a planetarium show inside a portable planetarium. Teachers set up reading centers in classrooms where families read together to find out more about a variety of space science topics including our solar system, spaceflight, beyond our galaxy, and ancient myths and legends about the sun and moon. Families used NASA websites to discover which space objects are “Near and Far” and how to locate the International Space Station for viewing in their backyards. For additional information, read the Family Star and Reading Party article in NEON. Urban heat islands are urban areas that are hotter than surrounding rural areas. New research shows the summer land surface temperatures of cities in the northeastern United States were an average of 7° to 9° Celsius warmer than surrounding rural areas over a three-year period. The complex phenomenon that drives temperatures up is called the urban heat island effect. But thanks to satellites, scientists are making progress in understanding the effect. Satellite data have been used to compare various urban settings. Find out what the researchers from NASA’s Goddard Space Flight Center in Greenbelt, Md., are reporting on the urban heat islands in the article in NEON. NASA Explorer Schools educator Haia Spiegel, a teacher at the Greater Hartford Academy for Mathematics and Science, created an inquiry-based activity called Ratio of Snow to Water after attending a Ice and Snow presentation at last year’s NES Winter’s Story research experience. Students analyze the layers of a snow pack and look at the individual snow crystals. Based on their analysis, they then calculate the ratio of snow to water. This is a way to connect science and mathematics. You will find this activity in NEON in the Satellite Meteorology forum including a PowerPoint presentation. NASA Explorer Schools educator Elliott Alvarado and his students from West Ward Elementary School have been helping NASA scientists by participating in the Students’ Cloud Observations On-Line, or S’COOL, project. Students make atmospheric observations of cloud type and density, record simple weather information, and then post these to a central website. NASA scientists compare the student observations to images and information recorded by weather satellites. Alvarado reports the activity increases student interest and participation in science. This activity complements NES modules Earth Climate Course and Satellite Meteorology. For more information, read the article in the Satellite Meteorology forum in NEON. For more information visit the S’Cool project website. Share your experiences with these three modules by posting on NEON. Register, log in, join the NASA Explorer Schools group and find the forum Lunar Nautics –Designing a Mission for Living and Working on the Moon. In your post, be sure to include your students’ problem-solving techniques for the design challenge and pictures. NASA Explorer Schools invites students in grades K-12 from across the U.S. and Department of Defense schools to participate in a live video chat with three outstanding women at NASA. The event takes place on March 29, 2011, at 2 p.m. EDT. Students and teachers can submit questions to Erika Alvarez, Mallory M. Johnston and Monsi C. Roman during this hour-long chat. The women will answer students’ questions about careers in science and engineering. Go to the chat page on the NASA Explorer Schools Virtual Campus website to participate in the webchat. You do not need to be a participant of the NASA Explorer Schools project to join the chat. To learn more about NES, visit explorerschools.nasa.gov, watch the What Is NES? video and read About NES. 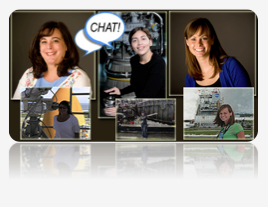 To learn more about the women participating in the webchat, visit the chat Web page. Almost 200 people from 15 countries have visited the International Space Station, but the orbiting complex has so far only ever had human crew members – until now. Robonaut 2, the latest generation of the Robonaut astronaut helpers, launched to the space station aboard space shuttle Discovery on the STS-133 mission. It is the first humanoid robot in space, and although its primary job for now is teaching engineers how dexterous robots behave in space, the hope is that through upgrades and advancements, it could one day venture outside the station to help spacewalkers make repairs or additions to the station or perform scientific work. Now that R2 is unpacked it will initially be operated inside the Destiny laboratory for operational testing, but over time both its territory and its applications could expand. There are no plans to return R2 to Earth. 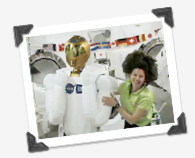 the first humanoid robot in space. R2 was delivered to the International Space Station by space shuttle Discovery on STS-133. Here’s an extension activity from the MY NASA DATA project that you might want to use in your meteorology class. In the lesson Tropical Atlantic Aerosols, students use real satellite data to determine where the greatest concentrations of aerosols are located during the course of a year in the tropical Atlantic region and their source of origin. They explore data and draw conclusions about aerosol transport and learn about the radiation budget’s effects of aerosols. For more information about this activity, go to NEON. Register, log in and join the NASA Explorer Schools group. The MY NASA DATA: Tropical Atlantic Aerosols activity is posted in the Satellite Meteorology forum. When teaching the NES module, Exploring Space Through Math — The Weightless Wonder, your students may be interested in some background information about NASA’s Weightless Wonder aircraft. The aircraft is a C-9. NASA acquired the airplane from the U.S. Navy on August 9, 2003, from Whidbey Island Naval Air Station in Washington state. The C-9 is the military version of the McDonnell Douglas DC-9 used for many years by the commercial airlines. The U.S. Navy and U.S. Air Force have used the C-9 aircraft to support passenger transportation, medical evacuation and special missions. The primary mission of the NASA C-9 is to provide NASA and government microgravity researchers the platform to perform their research in a reduced-gravity environment. The aircraft also is used for Heavy Aircraft Training for astronaut pilots; to support the movement of the shuttle from landing sites in California and New Mexico back to NASA’s Kennedy Space Center in Florida; Trans-Atlantic Landing support; and the Emergency Mission Control Move mission.